Eye Ads. Pvt. Ltd is one of the best Advertising agencies in Hyderabad. Established 29 years ago with a single goal to provide clients with the cutting edge branding solutions. Since its inception in 1989, it has stayed true to its goal, offering the full range of advertising, branding and communication services in impeccable style. 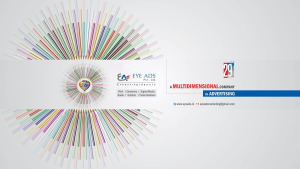 Eye Ads believes in working closely with the clients and works 24×7, serving big ideas developed after intense research into consumers’ behavior. Map of Eye Ads Pvt. Ltd. Brand Building Service - Strategy Development Service - Creative Branding Service - Creative Advertising Service - Brand Marketing - Media Planning & Buying Service - Brand Publicity Service - FM Radio Ads Service - Public Relation Service - Ad Film Making - Graphic Designing Service - Television Advertising Service - Corporate Presentation - Print Media Advertising Service - Newspaper Advertising Service - Digital Marketing Service - Outdoor Advertising Service.